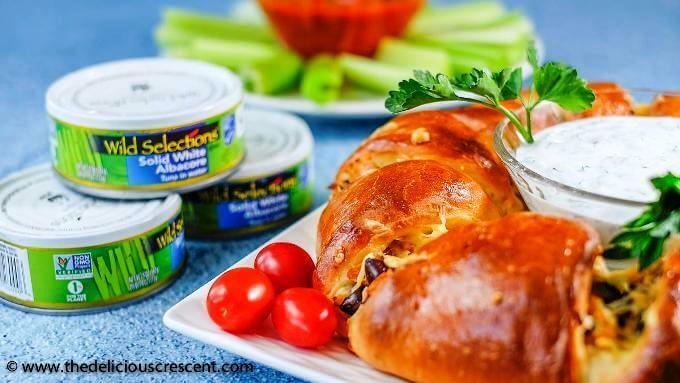 This cheesy Tuna Melt Crescent Ring is stuffed with super delicious high quality tuna packed with healthy and flavorful ingredients. Perfect for a party or as an elegant appetizer or meal. Impress your friends deliciously! Click on tags in the shoppable image above for the product info. 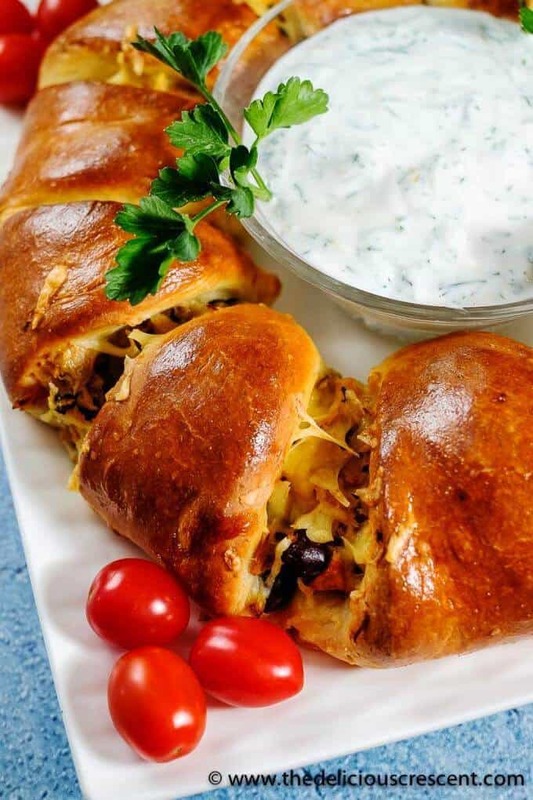 It is a popular classic sandwich creation using a tuna filling and cheese, which is then heated until the cheese is melted. 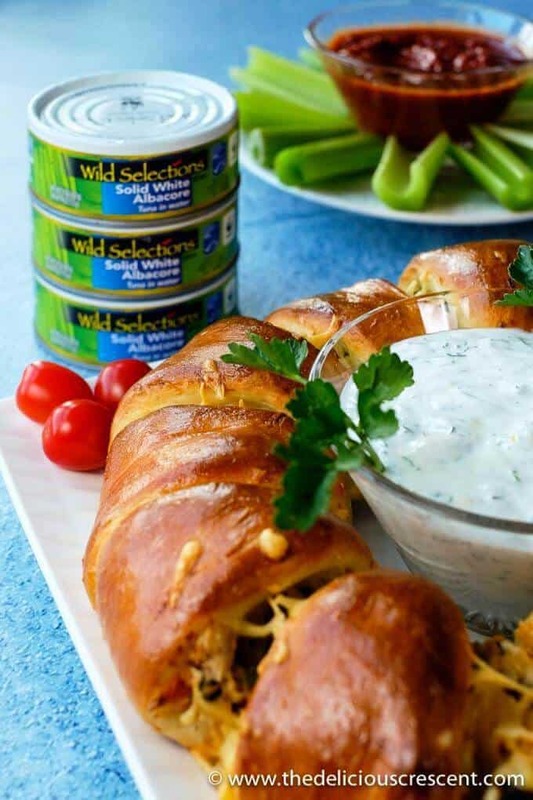 This creation marries two popular concepts into one crave worthy and elegant appetizer or meal filled with scrumptious tuna from Wild Selections. And I chose to complement it with super flavorful ingredients. The result is a spectacular dish that is not only tasty but wholesome too. And instead of making the tuna filling too creamy I paired this tuna melt appetizer with a luscious lemon dill sauce. If you want to enjoy flavor packed tuna melt prepared in a large batch in the oven and without mayonnaise then this is the one for you! It is freezer friendly too. I had never used the Wild Selections brand before. And I was impressed with it. The tuna really looks, tastes and smells clean. Chunky and fresh in an easy to open can. I could eat it straight out of the can. I was also happy to learn that they use simple ingredients in their products and that they are verified non-GMO. Tuna is a good source of omega 3 fatty acids, high quality protein, vitamin D and selenium. Due to its low saturated fat content and high quality protein it is considered a healthy alternative to other animal protein sources. Consumption of oily fish such as Tuna is encouraged as part of a healthy diet, as it a good source of the long chain omega-3 fatty acids that have been associated with a lowered risk of heart disease, improved brain function and support of normal growth and development. The idea of sustainability really appeals to me. I used to actually teach about this in one of my courses at the university. Sustainability is the concept of using the earth and environment’s resources in a way to support the present needs without compromising what we leave behind for the future generations. And Wild Selections tuna supports this mission. Do make a judicious selection of fish to prevent harm from pollutants. A resource that I have often used and which provides consumer guides is Seafood Watch. And it was nice to know that one can find the origin of tuna from Wild Selections right on their site. If your prefer the cheese to be more stringy, try mozzarella. Check yeast package instructions for suggested temperature. Allow the yeast to foam up well prior to adding other ingredients. Let the dough rise in a warm environment and give enough time for it to double in bulk in the first rise. 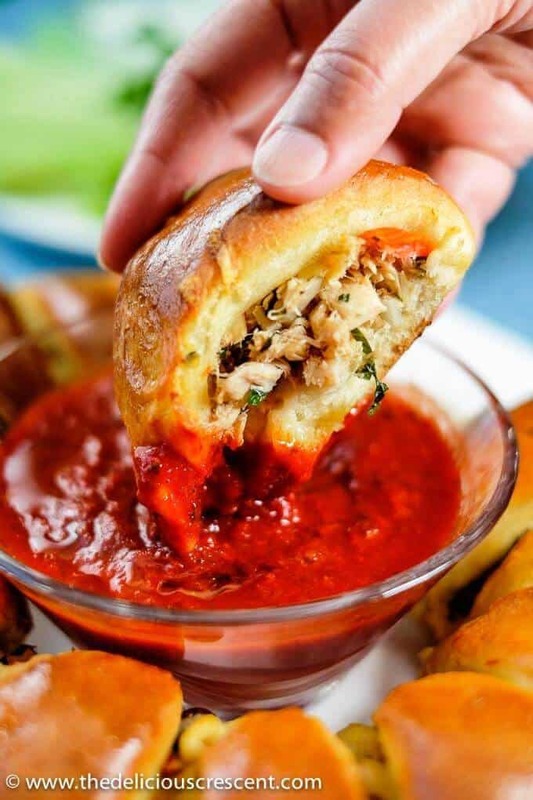 Make sure to let the stuffed crescent ring rise in volume too. Pro Tip: If you have trouble with the dough rising properly, then place the dough in an oven that has not been preheated. And place a bowl of hot water one level below the dough container and this should help the dough rise better. What to serve with this crescent ring? Other than the lemon dill sauce, you may also serve it with a tomato harissa sauce by combining some tomato ketchup with harissa. Heat the olive oil in a pan. Add the onions and sauté until translucent. Then add the garlic and sauté a few minutes. Next add the celery and sauté 2 to 3 minutes. Then add tomatoes and sauté until they start to soften. Add the olives, capers, herbs and stir. Turn off the heat. Drain tuna meat from the cans very well and break it up. Add tuna meat to the sautéed mixture. Season well with pepper and salt as per taste and combine the mixture. Scatter the yeast over warm milk. Then sprinkle sugar on the top. Let it stand for 10 to 15 minutes in a warm dark place until the yeast foams up on the surface. Then add olive oil, honey, 2 eggs, and about 3½ cups of the flour, salt and mix gently. When the mixture is loosely combined let it stand for a few minutes to help the flour to absorb the moisture. Then add the bran and mix it in. Next add another half cup flour or more, making sure to add as needed to make a dough. Knead it well for about 5 minutes. It is okay if it is a little sticky. It is important to make sure that the dough is not very dense. So try to use as little flour as possible to make this dough. I use KitchenAid Stand Mixer to make this dough but you can also make it by hand. Let the dough rise and double in size in a dark warm place. The time required for this rise may vary between 1 to 2 hours or more. After the dough has doubled in size, punch it down to release the air spaces. Divide the dough into 2 portions and let it rest. On a floured surface, roll out one portion into a 12 inch diameter circle. Let it rest for a few minutes, as this will help the dough relax and prevents it from springing back in the next step when cutting. Then using a pizza slicing wheel cut out 12 triangles. If they spring back just make sure to flatten them out. Line a 16 inch pizza baking pan with parchment paper and place a bowl in the center that has a 5 inch diameter base. Carefully arrange the triangles forming a ring, with the wide ends of triangles placed around the 5 inch bowl, making sure to overlap the triangles a little. Once all the triangles are placed around the bowl it should look like a sun with the pointed ends of the triangles toward the outer edges of the pan. Scatter 1/4th of the shredded cheese all around the bowl and over the wider portion of the triangles, where they overlap. Then place half the tuna filling mixture over the cheese and all around the bowl. Cover another 1/4th of the cheese over the tuna filling. Bring each pointed end of the dough triangle over the filling and tuck it under the wider side of the triangle in the ring. Secure it well. Repeat the above step all around the ring covering the filling. Remember that some filling will show between the gaps. Bake for 20 to 25 minutes until the dough is golden brown and baked well. 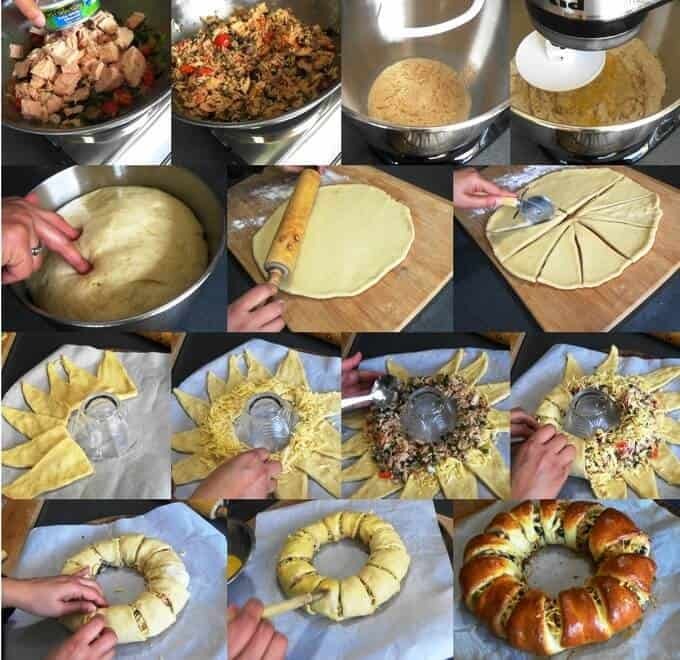 Repeat the steps with the other half of the dough and filling to make a second Tuna Melt Crescent Ring. Carefully transfer the crescent ring to a serving platter using the help of a wide and long serving utensil or a flat cake lifter if needed. Mix all the ingredients for the lemon dill sauce and adjust the seasoning as per taste. Transfer the dill sauce to a little serving bowl and place it in the center of the ring. Slice and enjoy. OMG, you had me at the lemon dill sauce! And what a unique idea combining the two ideas of a tuna sandwich and a crescent wreath. Awesome. Seriously that lemon dill sauce was really tasty and complements the tuna fish very well. Thanks Debbye. Love hearing amazing feedback! This is such an impressive party appetizer/meal! Love the Mediterranean flavors! I love a good crescent ring but haven’t tried a tuna melt filling. Yum! You must try it. Its quite filling and so wholesome too. Thanks Hannah :) It freezes well too! Thanks so much Ann. You make me so happy with your helpful feedback. That tuna I used for the recipe is really SO good.